Radwell International expands its Supply Chain Solutions to North Carolina. Radwell International, Inc. is dedicated to offering its customers more options, both domestically and globally, for their industrial automation needs. 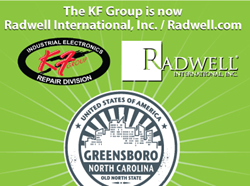 We are pleased to announce that Radwell International has acquired the KF Group of Greensboro, North Carolina. Radwell is also known as “PLCCenter” and is the world leader in industrial repair, surplus, factory new supply, and recycling services. It is our goal to continue to support and invest in the KF Group and Customers. All of KF’s Customers can expect to receive the same great personal service that they have enjoyed in the past from the KF Group, with enhanced product and service offerings backed by the worldwide resources of Radwell International. In addition to our international web presence, Radwell has facilities in New Jersey, Indiana, the UK, Canada, and now North Carolina. In addition to Radwell’s new Greensboro, North Carolina office please be sure to visit Radwell.com as your best web resource for researching and exploring the wide array of products and services available. To receive a quote or to place an order or for any other questions please call our toll free number 800.295.5495 or send an email to sales(at)radwell(dot)com.